The 104 I St Sa has quickly become a classic Sinn watch and one of the best selling watches in the company's history. The dial is highly legible, with its three hands providing optimum readability of the time. As an added benefit, it also features a day/date display at the 3 position with the day display in either English or German (you change the settings through the crown). As an instrument watch it has a polished stainless steel case and a crystal made of sapphire which is also used for the transparent back. The 104 I St Sa is low pressure resistant to secure the sapphire crystal at high altitudes and is water resistant to a depth of 200 meters. Although this watch incorporates many contemporary pilot's watch design elements, it also pays respect to a number of watches in Sinn's past. Verified Owner Comments: I'm extremely happy with this watch. It keeps remarkably accurate time, is very handsome, and makes me happy every time I look at it. Highly recommended! Verified Owner Comments: I love my first German watch, Sinn 104. I work in an office environment and usually wear a dress watch. When I want to wear a causal watch, I just feel that these dive watches are not quite match my work environment. After watching YouTube reviews of Sinn 104, I thought this might be a watch that meets my style. When I wore my Sinn 104 for the first time, I know this is the watch that I would keep. Sinn 104 is a perfect sports watch for people who enjoy wearing dress watches. This is just "Pure class”. Verified Owner Comments: I just bought this watch for a co-worker who was retiring after 40 years of service. He was overwhelmed by it to say the least. I chose this particular model because of its simplicity compared to other models, but when I received it I was surprised at how nice it really is. I cannot imagine there is another mechanical/automatic watch in the world that is this well made at this price. I was a bit jealous - and I wear an EZM3 every day. "Incredible watch - Incredible service"
Verified Owner Comments: What can I say about this watch that hasn't already been said. If you are on the fence about the 104, get off immediately and buy this watch while it is still available. Almost perfect in every way. The only thing that could compare to it is possibly the customer experience I received from Watchbuys. Fantastic retailer. Verified Owner Comments: This is a great looking watch, and it fits perfectly on my wrist. I love how the bracelet feels. I will definitely by another Sinn. Verified Owner Comments: Wore the Sinn 104 on a trip recently and it went beyond expectations. Seconds hand was easy to spot at a glance and syringe hands are stand out features of this watch. 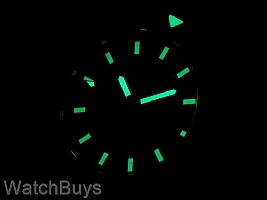 Markers take very little light to make the lume shine super bright and last for quite a while! The metal ring on the bezel before the dome catches a lot of light in low light situations to give dimension to the watch. I like the hex screws for changing the links and will have to try a Sinn leather strap later on, but the H-Link bracelet has very comfortable feel and does not pull out hairs. Has nice detail and catches the eye when the light hits the brushed H links and the polished rectangular mating pieces. What can I say? This watch is phenomal. 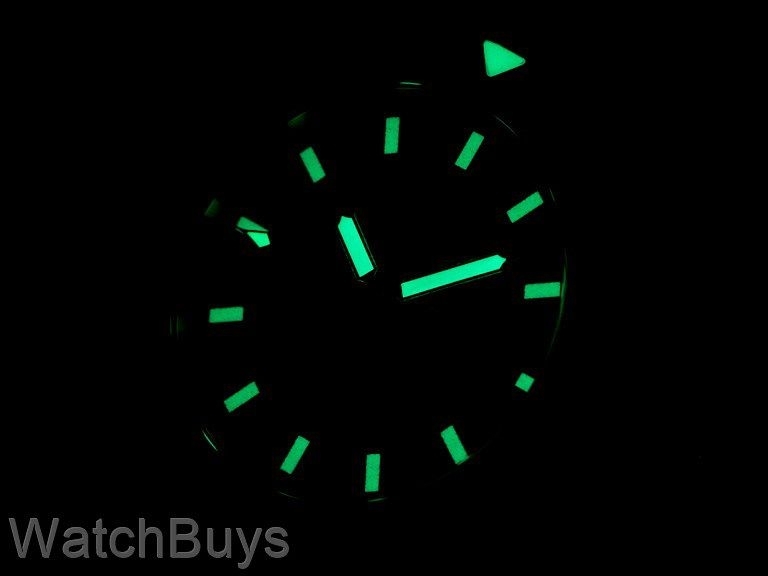 Looks great, super tough, amazing lume, really useful countdown bezel. Accuracy is insane I've had the watch for 2 weeks and it's +1 second after TWO WEEKS which is outrageous. Watchbuys did a fantastic job, even setting the time to my time zone which was a lovely touch! Verified Owner Comments: I recently made my first purchase from Watchbuys. It was the Sinn 104. As a first time customer of Watchbuys they contacted me before shipping the watch to check if I had any questions. The watch arrived very quickly. After receiving the watch I did have a few questions which were answered very quickly. I can't recommend Watchbuys enough. They know how to treat customers. As for the watch, it's been almost 2 weeks of constant use. The watch performs perfectly with great accuracy: about +5 secs a day. I love the white writing against the black background. And with the steel bracelet, the watch has great wrist presence. I hope to enjoy this watch for many years to come. Verified Owner Comments: I originally purchased this watch on the leather straps but didn't like the fact that with the leather it's not water friendly. So I went ahead and purchased the stainless steel bracelet that comes with this watch. The bracelet is super light-weight to my surprise, I almost thought it was titanium. All edges are machined with a nice radius so it's very comfortable on the wrist. Not to mention it's very adjustable. Overall the watch is accurate, highly legible, light-weight, tough and comfortable, these characters make it a great everyday tool watch for the money. Buying with Watchbuys is a breeze, too. The stuff was very friendly and took great care of me. Will come back again! Verified Owner Comments: This is a luxury level watch in every way. Everything about this watch is built extremely well and it exudes German craftsmanship at its best. The rotating bezel has a very solid click with no play, the bracelet is extremely solid with the screwed in links, and the case finishing and dial are very well done. This was my second purchase from Watchbuys and once again I received top notch customer service and blazingly fast shipping. "The Favorite of My Collection"
"Lives Up to Its Reputation As An Everyday Watch"
Verified Owner Comments: I now have the Sinn 104 I St Sa with both black and white dials. Each has its pros and cons. This black dialed version is probably more versatile and can be worn in more situations. It has better visibility, particularly when you want to look at the day and date. But, there are so many reviews and positive comments about the black dialed version - see the YouTube video by the Urban Gentry guy if you want to see one that is over the top. 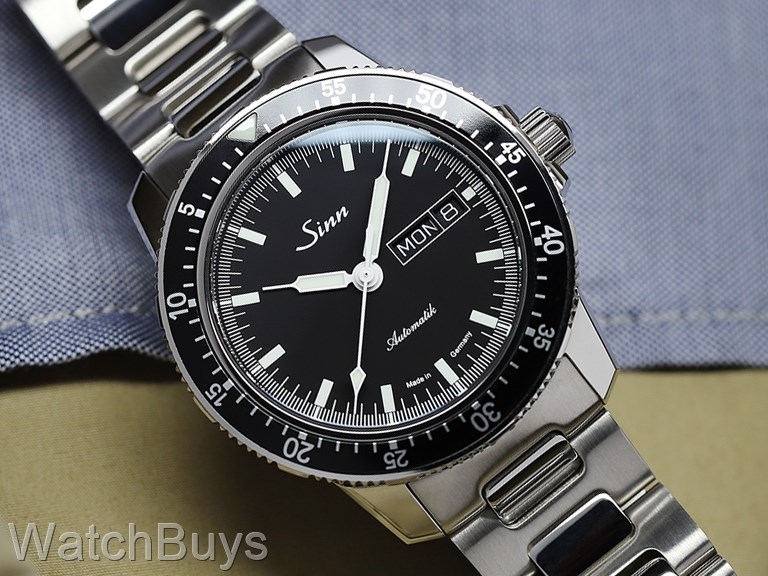 If you want to own a Sinn 104 that is a little more distinctive, go for the white Dial version. That said, I like both. Verified Owner Comments: For the price, I'd say you are getting a very high-end german watch that is truly a classic in making. The dial offers a very clean look which can pass as a daily watch and a dress watch. Truly, this could be a one-watch collection. It wears almost like a 40mm and quite comfortable on the wrist (I have tiny wrists), and perhaps the leather strap might be better. But I love the Sinn h-link bracelet and have nothing much too complain thus far. Mine runs around +5 sec per day. WatchBuys' customer service was great too! Will buy from them again!! Verified Owner Comments: First impression was how substantial it feels on the wrist and solid execution of its clean look. The black face is not overly flashy, and I love it. Thecrystal caseback is set flush which make it comfortable for daily wear. I wasnt too interested in the fine link bracelet, opting for the h link for the summer months and will switch to a strap come winter. Watchbuys' customer service was very good and shipping was quick.